Follow the links to view details of the jobs and to apply for the positions available. St. Luke's Medical Center Inc.
Watsons Personal Care Stores (Philippines) Inc. This post is a free job posting service only of Pinoy Pharmacists and makes no recommendations regarding potential employers. Applicants and employers must ensure the integrity and credibility of each other by requesting references or by asking for any additional information. 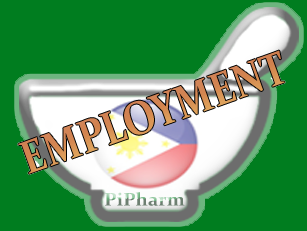 Pinoy Pharmacists site owners and editors are not responsible for safety, salaries, working conditions, or any other matters concerning employment. For job posting service please email info@pinoypharmacists.com.